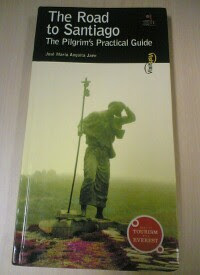 But I was glad that they sell guides books on the camino in Roncesvalles where I began my journey. A history buff like me would miss out on many things along the way without the guide. Information on which towns has an albergue (and the number of beds), elevation maps to make you cringe ('Oh my gosh, 700 meters climb in 4 km'), and so forth. I paid 22 euros for this guide book in Roncesvalles. I just found that Amazon UK is charging 23.70 pounds for it! If you can find for less, I highly recommend this guide. Alternatively, the Confraternity of Saint James in the UK has the "The Camino Francés, 2006" for only 6 pounds (minus the shipment). The Confraternity also have guides to the other Camino Routes. Those guides are hard to find since they are not as popular as the Francés (French) route. They have a distance map. Some history and practical advise along the camino.